my last post for sinulog. i have to finish these installments right on time and catch up with the remaining sinulog feel in the air. just yesterday, the colorful sinulog banners that used to hang above cebu's main streets, were removed. although this particular post isn't really about sinulog but on how we fend off ourselves from total breakdown, after we patiently stood for HOURS in order to revel on the sinulog grand parade. we had no choice but to stand forever since aside from the damp sidewalks, we were also in constant battle for a limited standing space. we chose to join the throng of crowds along osmeña boulevard, instead of being contented to watch the parade near our home. to think that we only had to go outside our house and then, right in front of us would be the sinulog contingents. however, we liked to believe that most of them were tired, since they had just finally performed in abellana. so, all we could see in their faces were relief and the joy that it was finally over, marred unfortunately with exhaustion. anyway, when dinnertime came, we eventually had to give in to our needed comfort, for the love of our stomachs and feet. my sister had been wanting casa verde ever since i told her about the sinful death by chocolate. aside from yogurt, she's also crazy about anything chocolate! so, casa verde was on her mind when we were deciding on where to eat and i also need to gratify myself with the ribs, once again. with regards to the fireworks in ayala, we (my sister, my cousin, and breinn) didn't bother to go there, after the street dancing since it was again about to rain. we instead decided to go home and just wait for the fireworks in abellana. we were sure that it would push through, no matter what. the savemore dancers should work on their smiles because we witnessed their not so pleasing frowns and the fatigue was all over their faces. they probably had too much practice aside from their pressing work. here comes again sinulog. i could still remember the agonizing experience of getting through crowds last year and again this time, i'm bracing myself for another body collisions. i expect this year to be worst than ever due to the rain and the foreboding clouds, hovering cebu since the first day of the year. but no way i'm complaining. if this is somehow my really small way to be a part of the celebration for the child Jesus, then i'm up for it because i'm not one of those people who are really dedicated to their faith because i sometimes fail in attending masses, had my last confession like a long time ago, and among other things. 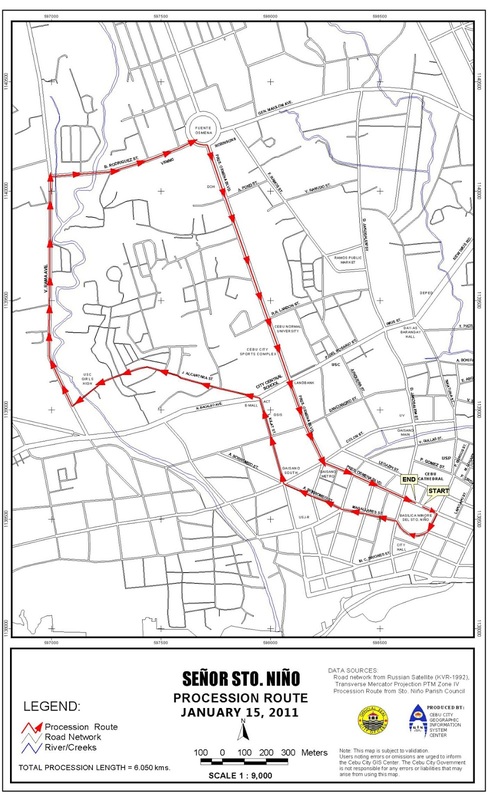 my sister and i decided to join the sinulog procession even with the impending rain, thinking the deed would serve like some sort of a little sacrifice. 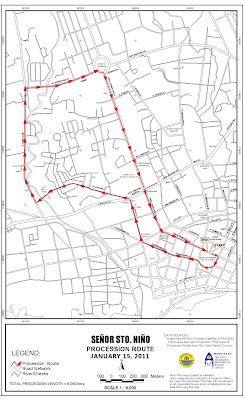 the procession happens the day before the sinulog street dancing which is every 3rd sunday of january. i last joined the sinulog procession back in high school and that was like eons ago. nah, i wouldn't be talking about my age here. it was friday again and the payroll was just in time to make my day, aside of course breinn, getting back from his exile in the capital. our glutton minds resynced in an instant and we then racked our brains on where we could eat to our stomachs' content. i might have suggested one or two places but i told him that it was his call that night since he probably missed cebu and wanted to eat something cebuano. 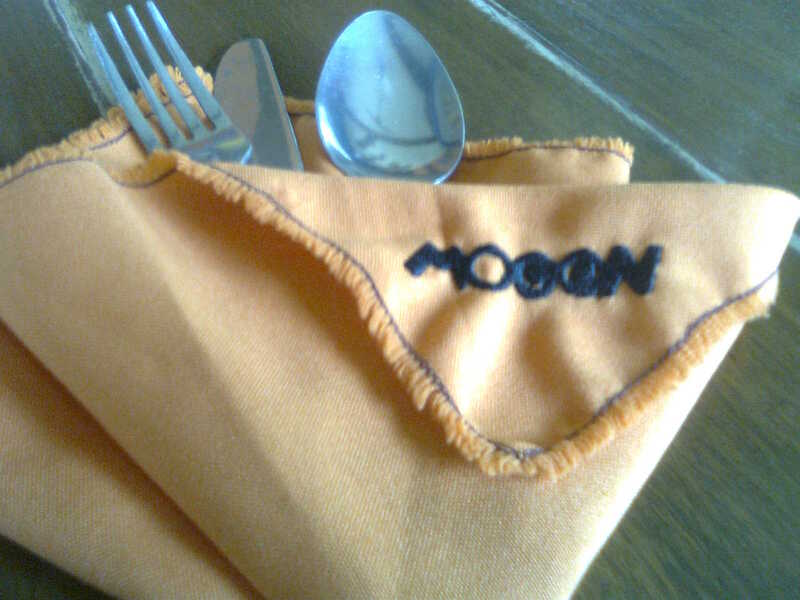 i just so blame the walk, it park for hoarding some of the great food finds here in cebu, even including mooon! a mexican-inspired restaurant (as they claimed in their menu) which had grown from their main branch in residential guadalupe and out to the city midst. though, i still find the main branch quaint and appealing for it being an old house and having transformed into a cozy dining place. yes, this is one of the many remodeled old houses in cebu, aside from casa verde (please see my post here.) and stk ta bay! (here). now, i had covered two three in here. more to go! anyway, since i had painstakingly endured the jeepney rides this week and i even had to wear a pair of slippers to work and carried my gratifying heels on top of my usual gargantuan load, i rewarded myself a lunch treat in mooon. haha! even though it is one of those "ting-bitay" (suicidal) days, as we fondly call the few days before we finally have our volatile salaries into our payroll accounts, my urge to eat just went overboard my logic and sense of frugality. So okay, it’s got no preservatives added. That’s really good, right? Not just because it doesn’t have those icky, harmful ingredients, but it also means... that it's good for my health and yours as well. Who doesn't want to have another healthy bottle so available in your "suking tindahan"? So far anyone who still has a hard time believing that Minute Maid has got no preservatives added - meaning it's THAT natural, it's almost like it's plucked straight from the tree, it's just as Mother Nature wanted your orange juice to be, it's got nothing but the good stuff yes, none of those potentially toxic stuff that can harm your brain, kidneys, heart; cause tumors aargh- the list of preservatives' bad effects just go on!!! Anyway, just to prove a point on just how good Minute Maid Pulpy is 'cause it's got NO PRESERVATIVES ADDED, I'm gonna have to drink a whole lot of that pulpy juice for a healthier me and have a great year ahead and even years to come. Now, who wants to hop in? Oh, my loyal stuffies even want to! casa verde has been quite successful for the past few years, having expanded to two more branches with its first expansion in the walk, it park. a short time thereafter, another casa verde opened in the terraces, ayala center cebu, giving their loyal customers more convenience as compared to their inconspicuous main branch near ramos street. it's one of the many restaurants in cebu that have humble beginnings in their remodeled ancestral houses and turning these into homey restaurants. 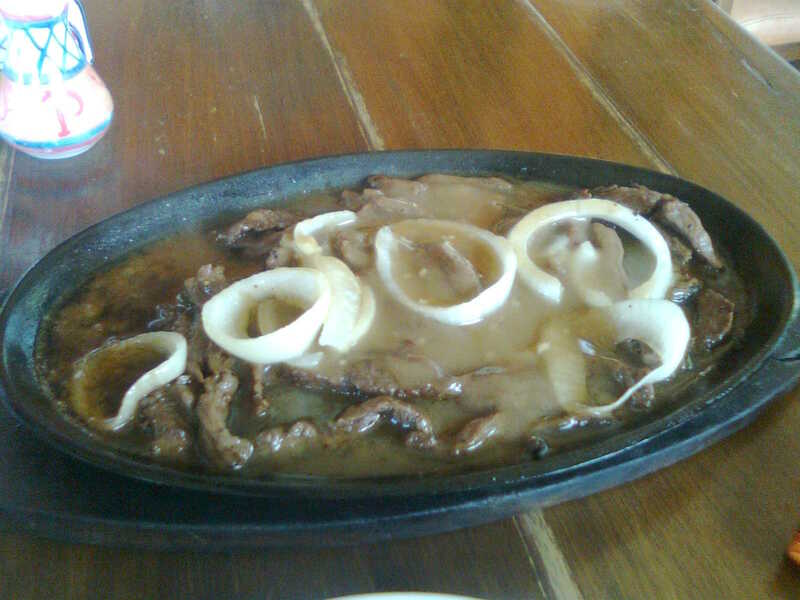 with casa verde in it park, stressed-out slaves here, need not go far in order to appease themselves with good food. they indeed have a lot to thank for, with casa verde and other restaurants' convenient location. more convenient for me since i would only have to go down my building's elevator, do a little walk to the walk (har har) and then there's casa verde! this time, i tagged my parents along since they're in town. the infamous ribs in casa verde! talking about casa verde, it's always about the ribs, its uber delicious flavor and the insane serving! it's a crime not to order this one. on second thought, it's just the japanese equivalent of the blog title anyway and it's really nonsense for you to go to that extent. it just means "alone in rai rai ken". i don't know what the online translators will exactly do for you because some translations could even confuse you more. oh, don't be fooled with that ramen in the pic. it's just a snack ramen, a half-size ramen served in rai rai ken, it park. it's only in this branch that they have this version. perfect for those like me who still want to make a room for other food. however, they only offer it for kantonmen. just too bad. i am just into eating. food would always be my comfort and my stress reliever and that's why i'm really having a problem getting rid of the extra fat persistently clinging around my waist. a lot of people tell me to do sit-ups regularly but i had never put any of my health intentions into action. i even had this wild aspiration to have a somewhat perfect body by summertime. haha! cebu welcomed the new year with overcast skies, chills, and rain showers and the dreariness seemed to last up to this day. however, there was no storm advisory from pag-asa (the philippine weather bureau) and we are just experiencing just another cold front. well, back to my very first day in 2011, my family and i attended a wedding of a relative. i fought my sleepiness due to vacation sloth, with the urge of checking out san remegio beach club, which has made quite a name for a long time already.